Bageshwar lies at the confluence of Saryu and Gomti rivers with the blessings of Lord Sadashiv, the redeemer of all sins. 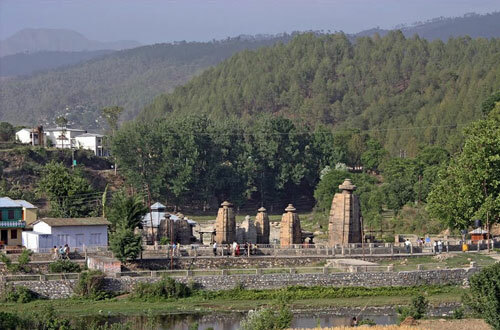 There are numerous famous temples dedicated to Gods and Goddesses in the proximity of Bageshwar. Bageshwar is a place of extreme religious and historic significance. 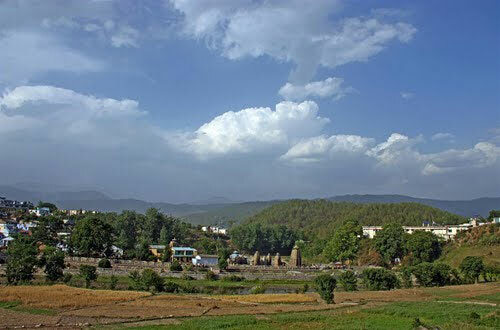 The Bhileshwar and the Nileshwar mountains border the east and the west of Bageshwar while the north and south are surrounded by Suraj Kund and Agni Kund respectively. According to the puranas, this place has the power to liberate one from shackles of births and deaths. For the entire state, Bageshwar has been the symbol of faith. Bageshwar is the base camp for treks to popular glaciers like Pindari, Kafni and Sunderdhunga. The most important temple of Bageshwar is Bagnath temple which is dedicated to Lord Shiva. It is situated at the heart of the city and thousands of devotees throng the temple on the occasion of Mahashivratri. The temple was constructed by Laxmi Chand around 1450 AD. 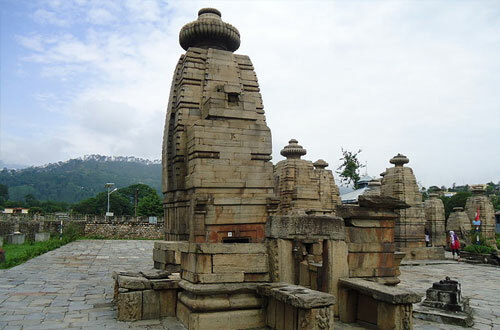 The temples of Baijnath are located on the left bank of Gomti. The main temple which is just below the house of Mahanta is dedicated to Lord Shiva. Since the construction of the temple is similar to the Tailihata group, it can be said that it belonged to the same period as Tailihta. About half a kilometre of Bageshwar lies the Chandika temple dedicated to Goddess Chandika. The Sriharu temple is located 5kms from Bageshwar and every year on Vijaya Dashami a large fair is organised here. The Uttaryani Fair is the most important fair of Bageshwar held on the occasion of Makar Sankranti on January 14th. The lace is considered to be as holy as the Ganga at Varanasi and therefore the fair attracts hundreds of devotees. Bagnath Temple: Bageshwar got its name from an ancient temple of Lord Shiva situated in the heart of the town. According to myths and legends, sage Markandey was visited by Lord Shiva in the disguise of a tiger. This sacred shrine was built by the rulers of Chand Dynasty in 1602A.D. A fair is held every year on the auspicious day of Shivratri. This sacred temple is visited by thousands of devotees every month, throughout the year and especially during the period of ‘Shravan’. Bagnath temple holds the idols made from 7th to 16th century. Chandika Temple: The deity of this sacred shrine is Goddess Chandika. The temple is situated very close to the Bageshwar town. Chandika Temple is flooded by devotees during ‘Navratras’. Shri Haru Temple: It is situated at a distance of kms from Bageshwar town. On the auspicious occasion of ‘vijay dashmi’ a large fair is held at Shri Haru Temple. The people of Kumaon have strong belief in this sacred temple. 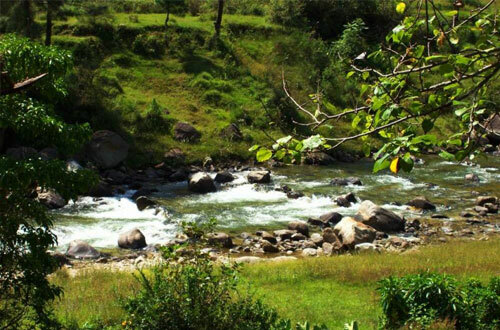 Gauri Udiyar: It is situated 8kms from Bageshwar. There is a huge cave in Gauri Udiyar enshrining the ancient idols of Lord Shiva. Other temple near Bageshwar: Agnikund temple, Nileshwar temple, Kukuda Mai temple, Shitla Devi temple, Trijugi Narayan temple, Hanuman temple, Jwala Devi temple, Radha Krishna temple, Bhileshwar Dham, Suraj Kund, Golu temple and Praktishwar Mahadev. Pindari Glacier: Pindari Glacier is situated in Bageshwar district of Uttarakhand state. Pindari Glacier has invariably lured mountaineers and trekkers because it is one of the most easily accessible of all the Himalayan glaciers. Pindari Glacier lies on the edge of Nanda Devi, which is the highest peak of India. Pindari is a big and steep glacier measuring 3.2km in length and 1.5km in breadth and is situated at a breathtaking altitude of 3353mts above sea-level. The trek to Pindari Glacier is of 45kms from Base Camp - Song. Pindari Glacier is the source of Pindar River. The trekking route to the glacier traverses along the southern wilderness of the Nanda Devi Sanctuary offering captivating and invigorating views of peaks like Panwali Dwar (6683m) and Maiktoli (6803m). A trek to the Pindari Glacier is a "soft adventure" experience and well within the capacity of any trekker who is in love with nature and its pristine glory. Sunderdhunga Glacier: Sunderdhunga literally suggests the valley of beautiful stones. The eminent glaciers of this valley are Maiktoli and Sukhram. Sunderdhunga valley is on the right side of Pindar valley. 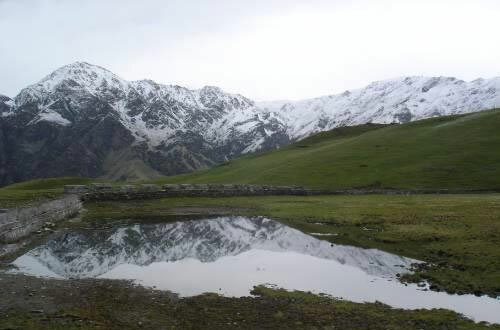 Trek to Sunderdhunga valley is tough with comparison to Pindari and Kafni Glacier trek. The trek to Sunderdhunga is of 54kms from Base Camp - Song. The trekking route up to village Khati is prevalent among Pindari, Kafni and Sunderdhunga Glacier. The snow-capped peak distinctly visible during this trek offers spectacular scenic vistas of nature. Mrigthuni (6856mts), Maiktoil (6803mts), Panwalidwar (6663mts) and Tharkot (6100mts) are clearly visible during the trek. Sunderdhunga is approximately 24 km beyond the village Khati. After Khati one has to go to village Jatoli, which is 7 km away. Jatoli to Dhungia Dhaun is a tough trek of about 8kms. One should spend the night in Dhungia Dhuan either in shepherd huts or in camping tents. Beyond Dhungia Dhuan, it is necessary to take a guide even for experienced and professional trekkers but it would be better if you book a guide and porter from the very beginning of the trek. Patal Bhuvaneshwar: Patal Bhubaneshwar is sub-terranean shrine of Lord Shiva situated 67kms from Munsiyari. The way to the temple is through a tunnel which leads into the cavern through a narrow dark passage of water. You can see many rocks having various shapes and figures which resembles many gods and goddesses. This cave temple is also said to be the abode of thousands of gods. This site is visited by thousand of pilgrims every year and especially on the auspicious day of Shivratri. It is situated 51kms from Bageshwar. 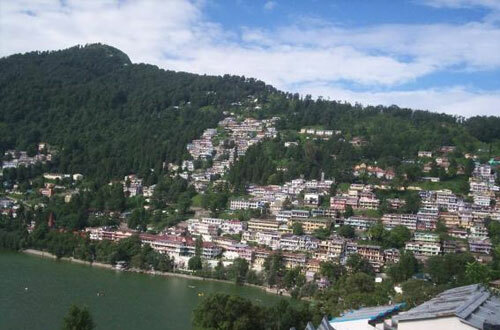 Didihat: Didihat is situated at an altitude of 1,725mts above sea level in Pithoragrh district of Uttarakhand state. 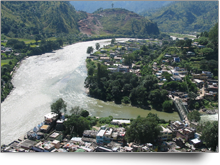 Administratively Didihat is a tehsil and subdivision of the Pithoragarh district. This region was under the reign of Raika Malla kings of Sirakot. Later in 1449 AD this region came under the control of Chand rulers, after defeating Doti Kings of Nepal. Didihat is rich in flora anda fauna offering picturesque views of verdant valley surrounded by attractive ridges. It is situated on the pilgrimage route to Kailash Mansarovar. 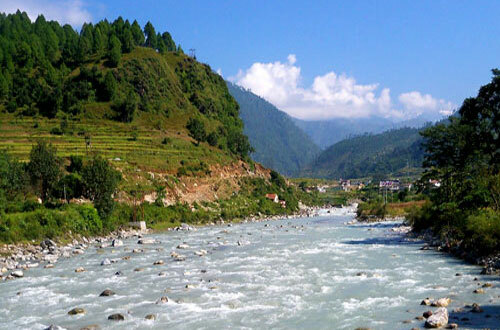 Didihat is situated at a distance of 76kms from Bageshwar. Kausani: It is one of the most popular hill stations of Kumaon perched at an elevation of 1890mts above sea level. Situated 38kms from Bageshwar this charming hill resort set amidst several snow- capped peaks is endowed with extraordinary natural beauteousness. Mahatma Gandhi and was absolutely fascinated by the scenic grandeur of Kausani while a visit in year 1929. Sumitra Nandan Pant, a renowned Hindi poet was born in Kausani. Binsar: It is situated at a distance of 18km from Bageshwar. A famous temple dedicated to Lord Shiva, Bineswar is the major crown puller of Binsar. Perched at an elevation of 2,412mts above sea level, this temple was constructed by King Kalyan of the Chand Dynasty. Binsar is situated amidst dense jungle offering placid environment and exquisite surroundings. The views of major peaks like Chaukhamba, Panchchuli, Nanda Devi, Nanda Kot, Kedarnath and other peaks are stimulating from here. Almora: The district of Almora is a picturesque place located in the Kumaon region of Uttarakhand. 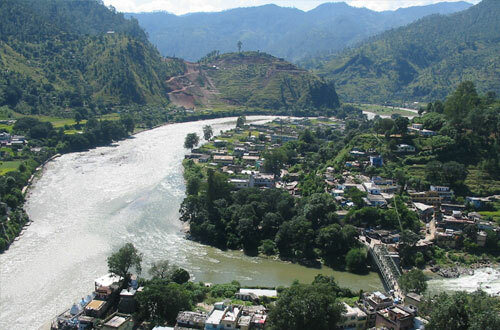 Almora is famous for its magnificent beauty, panoramic view of the Himalayas, rich cultural heritage, exquisite wildlife, unique handicrafts and delicious cuisine. Almora has been developed by the Chand Rajas and then maintained and further developed by the British. It is known as the "Switzerland of India"’ and the place has also been made famous by Swami Vivekananda who meditated in the region. 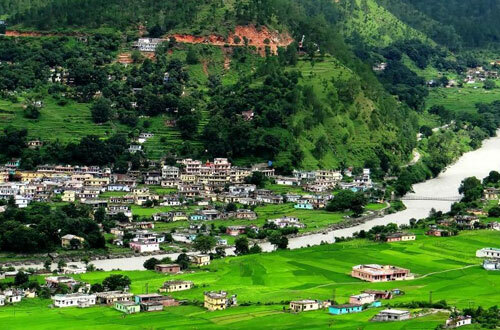 It is situated 64kms from Bageshwar.